Grands Boulevards is the term Parisians use to describe the east-west area around the boulevard running from Place de la République to Place Charles de Gaulle. This boulevard changes names six times and sits north, paralleling the Faubourg St Honoré, Quai d’Orsay, and the Marais quarters. In the eastern section of the Grand Boulevards, the district is more working-class whereas the west consists of department stores, upscale shopping, trendy cafés, and the district’s crown jewel – the opulent Opéra Garnier or Palais Garnier. This opera house is the world’s most lavish and was commissioned for construction in 1862 by Napoleon III. The theater took 13 years to complete and its grandeur is simply extraordinary – with its chandeliers, marble columns, and priceless paintings. This theatre served as the focal setting of Gaston Leroux’ famous novel, Phantom of the Opera. 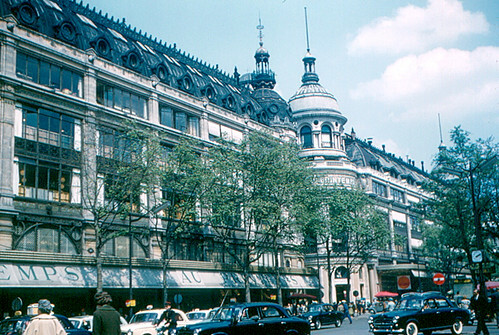 Notable sites along the Grands Boulevards include the Hôtel Drouot, which is Paris’ central auction house, the Passage Jouffroy, which is a 19th century passageway that is today lined with shops, and the Cimetière du Père-Lachaise (Père-Lachaise Cemetery). The latter is a cemetery that houses the tombs of many famous people in history, including composer Chopin, playwright Molière, rockstar Jim Morrison, writers Balzac, Colette, Wilde, and Proust, and the famed medieval lovers Héloïse and Abélard. There are also a number of museums along the Grand Boulevards: the Musée Nissim de Camondo, the Musée Jacquemart-André, the Musée Cernuschi, and the Musée Gustave Moreau. The Musée Nissim de Camondo is set in a grand hôtel built by the Comte Moïse de Camondo in 1911 and features the world’s most exquisite furniture, showcasing boiseries (carved wood panels), bibelots of the 18th century, and the Count’s family treasures, which include Chinese vases, crystal chandeliers, porcelain, silverware, and Beauvais tapestries. The Musée Jacquemart-André is one of the grandest private residences of 19th century Paris and showcases the artistic works of Rembrandt, Canaletto, Giovanni Battista, Lorenzo Bernini, Alfred Boucher, Frans Hals, Andrea Mantegna, and Sandro Botticelli. The Musée Cernuschi is an Asian art museum featuring 8th century silks, Persian bronze objects, contemporary paintings, and priceless Neolithic pottery from the 3rd century BC. Finally, the Musée Gustave Moreau showcases the life and works of the 19th century French Symbolist painter, Gustave Moreau. You’ll also find a few baroque churches in Grands Boulevards like the 17th century Ste Élisabeth and the 15th century St Nicolas des Champs as well as 19th century churches like the Notre-Dame de Bonne-Nouvelle, the St Augustin, and Chapelle Expiatoire. The latter is a chapel mausoleum built on the grounds of the Madeleine cemetery, the original burial site of Louis XVI, Marie-Antoinette, and 3000 other French Revolution victims. Louis XVIII, the brother of Louis XVI, commissioned its construction as a tribute to his brother and his family.